That wallpaper just makes me happy. 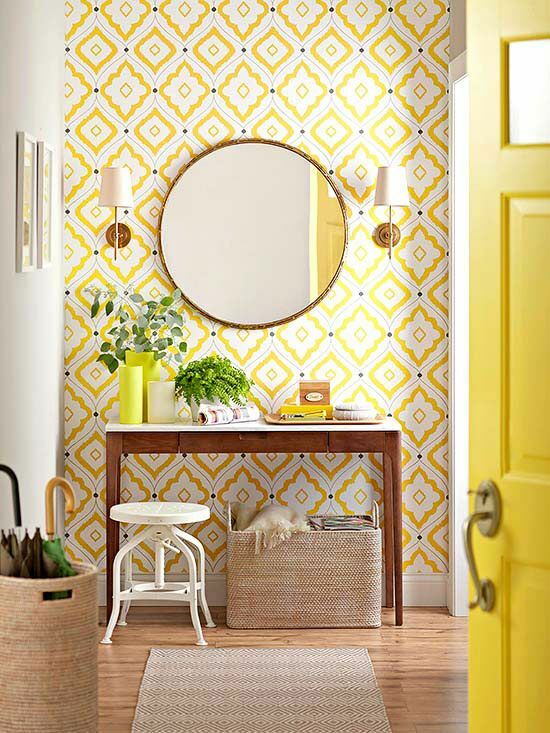 An entire room in this pattern might get overwhelming, but a feature wall is simply stunning. I am officially a sucker for build-in book cases. 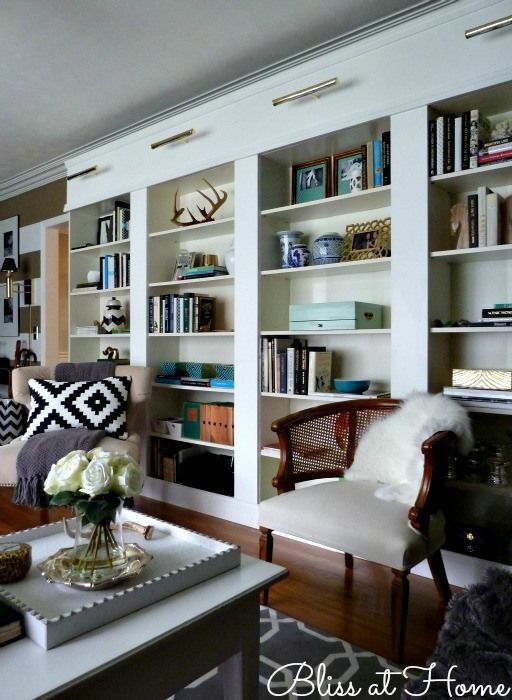 I love how she took these IKEA book cases and made them custom! 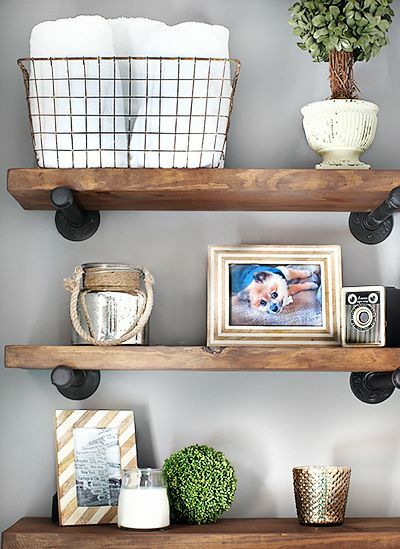 On the topic of shelves- these rustic/industrial super easy shelves just go to show that style doesn't have to mean difficult. If you can hang an IKEA shelf, you can hang these. 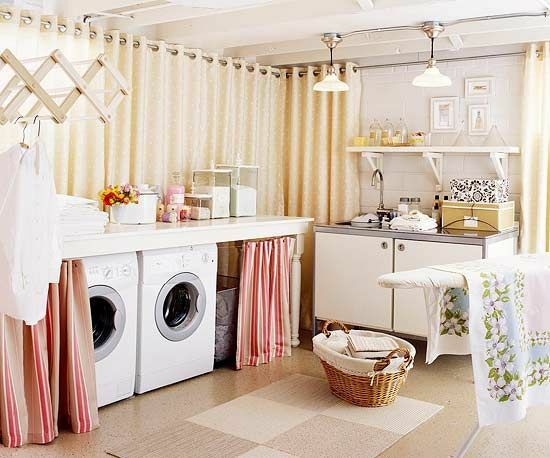 Now excuse me while I daydream that this is my laundry room. There is approximately a 0.0% chance that my laundry area in the basement of my 114+ year old home will ever look remotely like this. Pop by and visit BHG's BHG's Best DIY Ideas and Blogger's Best DIY Ideas boards to get some DIY ideas and inspiration for you own projects (and maybe discover a few new bloggers to check out too)! I only have a week and a half before we close on Frankie the Fliphouse, and I have a lot of ducks to get in order and a lot of projects I want to conclude before this happens. Which means I have about four thousand things going on simultaneously. No big. I worked on a lot of projects this weekend, but have no finished projects to show yet. Instead of rambling about the DIYs that I have yet to complete, I thought it might be fun to share a few of my favorite pins as of late. 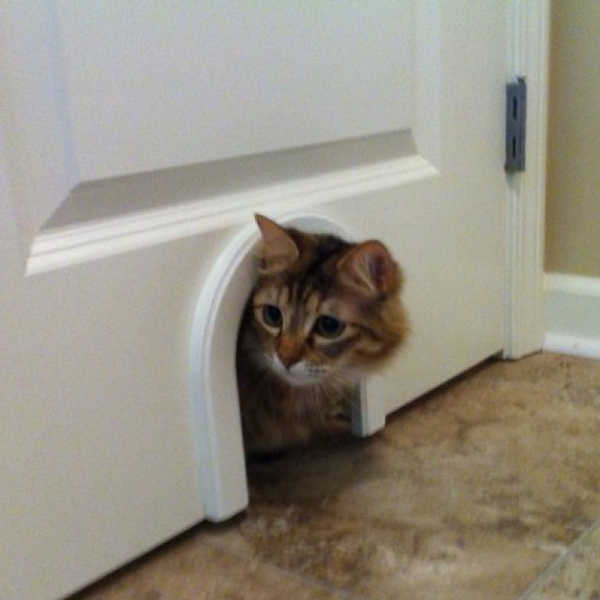 I've titled this 'the cat and mouse door' and I think it's superbly adorable. Although this pin is from Victoria Elizabeth Barnes, a friend of mine actually has a similar (but slightly larger) 'mouse hole' cut next to her basement door. This is 100% getting recreated in our next house. 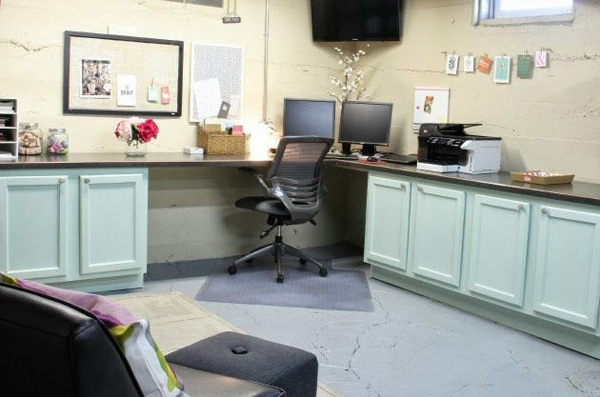 I'm jealous of this basement office from Design Your Dwelling. With a 100 year old basement and plumbing (and clutter....) everywhere, this could never be my reality, but I love how clean and crisp it looks! Normally Country Living Mag isn't really my thing, but if this dining room is any indication of what's in the pages lately, maybe I need to change my mind. Yup, I apparently have basements and dining rooms on the mind lately. And even though I'm not generally one to decorate for any holiday other than Christmas, I may buy these just to start depositing them on friend's lawns. 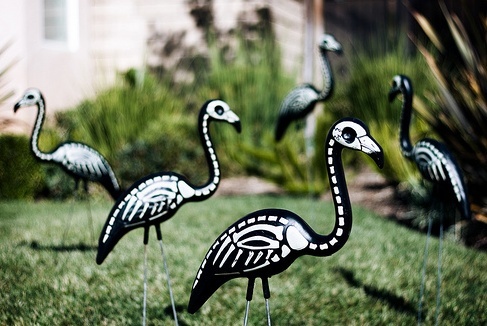 Seriously how can skeleton flamingos not make you smile?! And that concludes my randomness for today. Off to attempt to make a dent on my to do list. I wish you a productive Monday! Me and my one track mind are still scrambling plugging along, getting ready for the kitchen install (hopefully this week keep your fingers crossed! ), and admittedly haven't focused on much else lately. Instead of boring you with the latest developments about new light fixtures, I figured it's been a while since I shared an amazing room I found on pinterest. 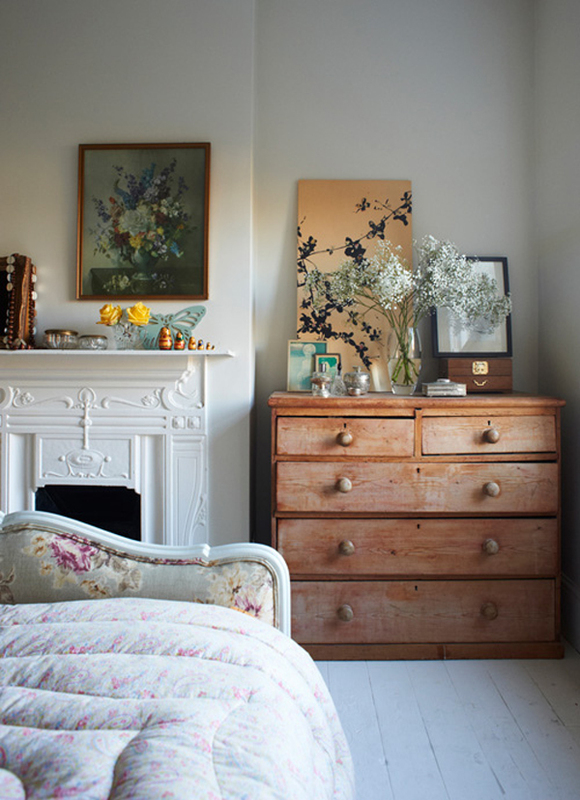 I instantly fell in love with this relaxed, eclectic bedroom when I saw it. I'm not generally a floraly girly girl, but I'm loving the variety and texture that all the different flowers/patterns introduce. It's a floral explosion in the best way possible. And I'm pretty sure I'd die to have that fire place surround- it's sublime. Anyway... do you love this room as much as I do?